Silk End table is an elegant small table that works perfect for the any glam set up. The silk has very fine metal work with the twisting design and a very thin bottom plate complemented by the thicker top frame and the white marble top. Silk end definitely has a lot of character for a small end table. 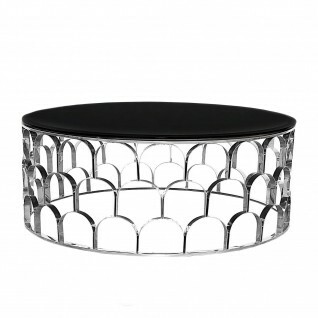 Width: 12" | Depth: 12" | Height: 21"
Sequenza Luxury Round Coffee Table features a black 12mm beveled black glass top with silver polished stainless-steel base.